This power house is built in a brick bunker buried into a hill side. One side has the inverter and battery, the other side has the hydro equipment. 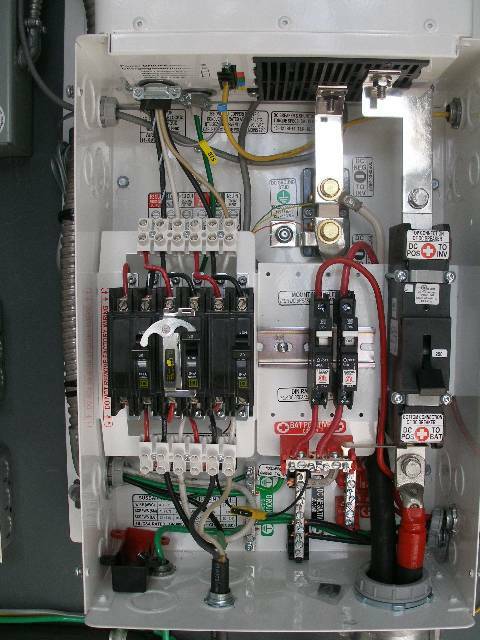 This inverter is built onto a Magnum Mini Panel, providing all AC and DC breakers as well as AC bypass switching. Using this panel makes installation easier as much of the wiring can be done in the shop before installation. the use of this panel also adds two years to the inverter warranty. 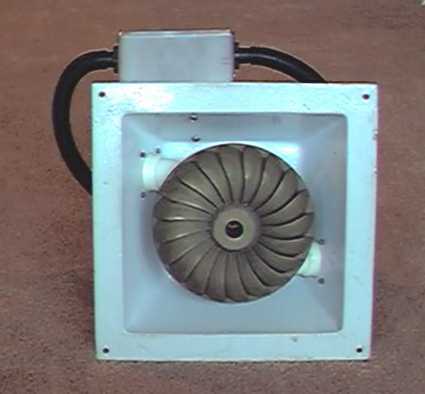 The two nozzle turbine can be turned down to produce less power when the residents are not on the property. This is good practice as it uses less water if that is an issue. The power line connects to the home through under ground conduit, a distance of 35 meters. 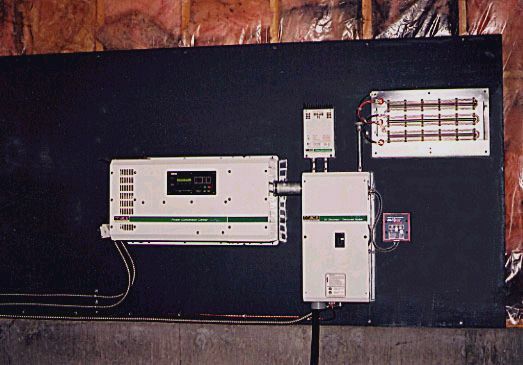 Battery metering in the home provides voltage, current, battery capacity, amp hours, and seven other conditions. The LH 1000 low head propeller turbine to be installed. 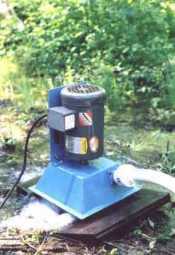 An LH1000 operating under 6 feet of head, producing 500 watts. 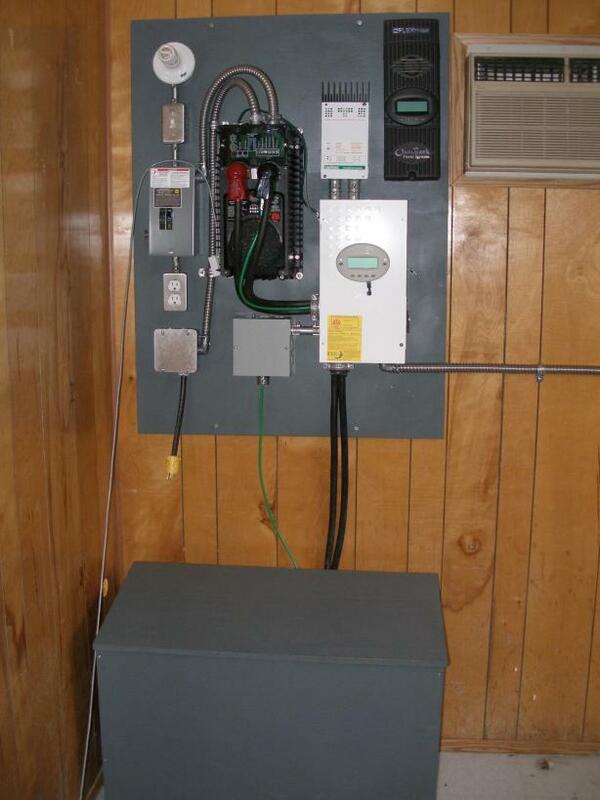 An example of a custom made, off grid home power system for a modest electrical demand. The four Surette S-550 batteries have a nominal capacity of 428 amp hours at 24 volts. They are charged by a back up diesel generator, or the LH 1000 low head hydro turbine, or in the summer by a solar array. 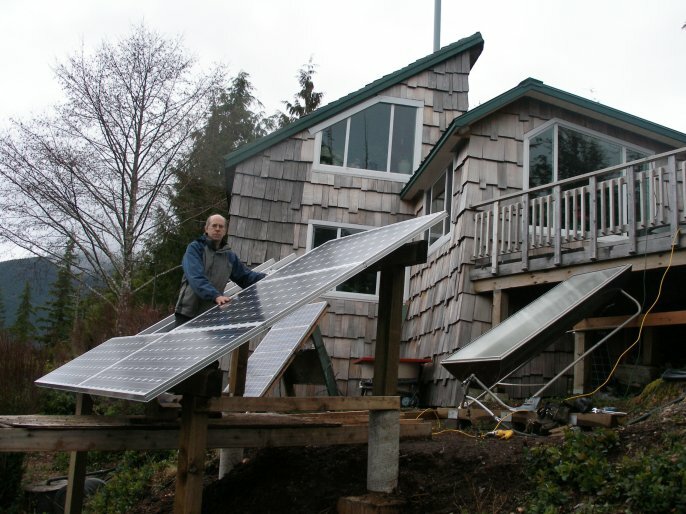 This is a good example of an off grid home power electrical package that can operate without any hydro or solar charge source. By running a gas or diesel generator for several hours a day, sufficient charge is stored to operate from the battery for the rest of the night and day, thus saving gas, money and noise pollution. 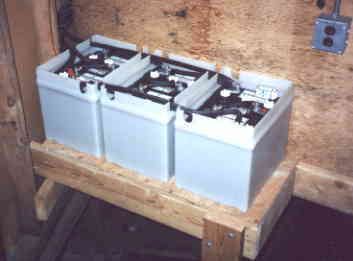 Vented battery box with four Surett S-550 batteries. 450 amp hour (20hr) capacity at 24 volts. 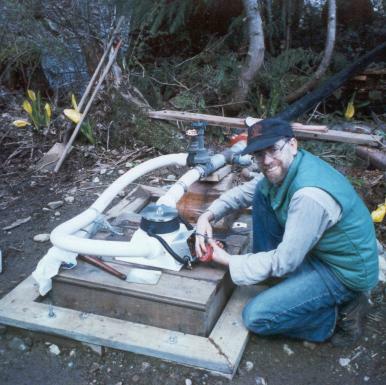 The owner and the new hydro turbine during construction. 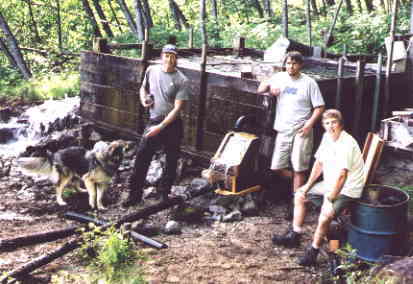 The power house and penstock was installed by the owner. The new electrical panels on the right. Transformer box below. In addition to the hydro, we upgraded a small 300 watt PV array to 1 kW. 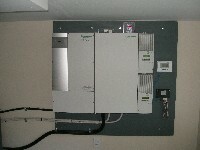 An existing solar hot water panel showing behind. This is the new battery box. Towels prevent disastrous shorts during assembly. This site had been operating on a small 300 watt PV array and wind turbine for many years. 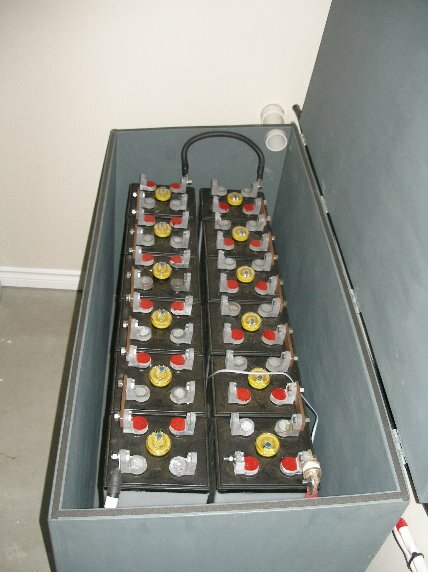 As is often the case with solar only systems, a gas generator was frequently used to top up the old battery bank. Later we did a complete rebuild and added a 1 kW hydro turbine and 700 watts of additional PV with an MPPT tracking regulator. In addition, new batteries, a new 24 volt inverter, controls and breakers were added. The system had been on 12 volts, and a Magnum 12 volt inverter had just recently been added, but as is usually the case, it is necessary to convert over to 24 volts when DC power levels get to the 1 kW range. See the solar page for the PV upgrades on this site. Inside the lovely home equipped with all the modern electrical gadgets. 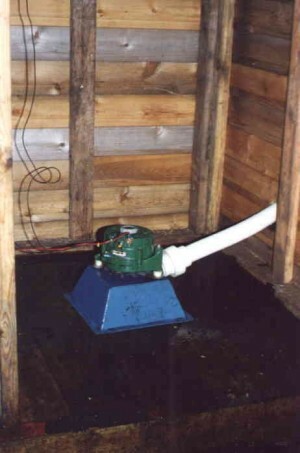 The Intake filter and flume feeds the 1000 foot long, 3 inch polyethylene penstock. 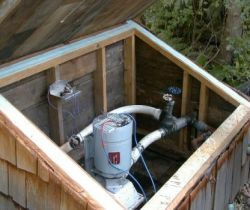 Because this stream dries up in the summer, the system includes the 1 kW solar. The existing wind turbine and two 60 watt PV modules supply charge to the old 12 volt battery which is used for existing 12 volt lighting. 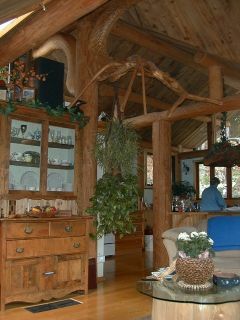 The lovely interior of the home powered by this system. plastic box. Another filter is on shore. 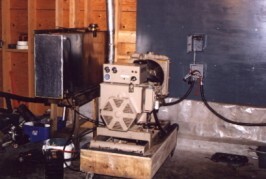 For several years a 3200 watt gas generator was the only power source at this unique B&B retreat on the road to the Whistler - Blackcomb ski area. 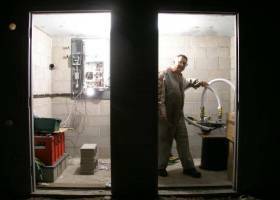 Every time an electrical load was needed, the generator had to run, regardless of whether it was a light bulb, or a power tool. The cost of gas was becoming increasingly hard to justify. 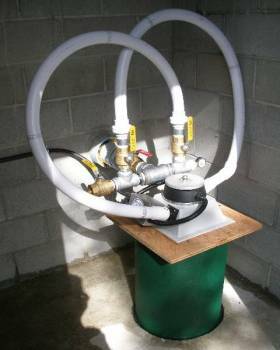 We designed a system to completely replace the gas guzzler, and to work efficiently with an output of from 100 watts to peaks of over 3,000 watts. 27 volts, equaling 780 watts. and the plug in point. Ford alternator driven by four inch turgo runner. Turbine: Turgo turbine in welded steel housing. This facility provides power to a hiking program base camp. 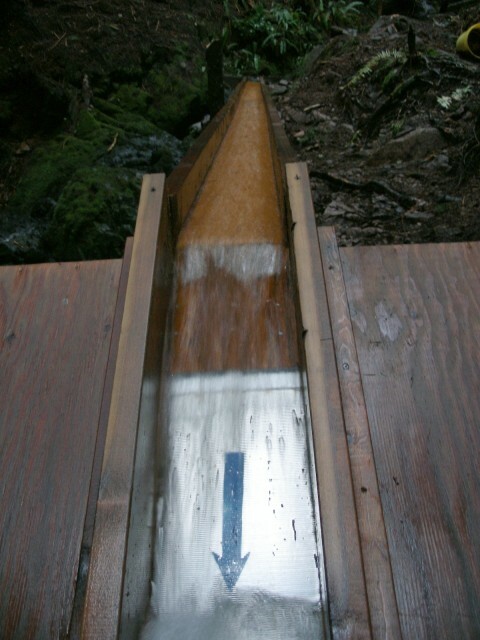 Water is diverted from a very unstable creek by means of a wooden flume to a settling tank. A 1000 foot long, 3 inch diameter series 100 polyethylene penstock dropping 140 feet supplies the water to the power house. 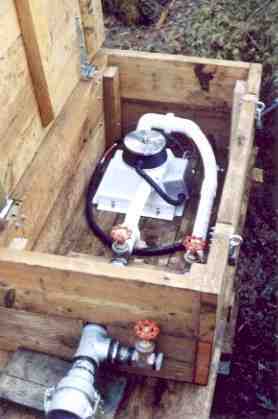 Controls are mounted on a removable plywood backing and the panel is removed at the end of each camping season. Regular outlet boxes make it easy. Two turbines are used to produce a total of 75 amps at 24 volts DC. Two generators gives added flexibility and backup. Turbine / generator: Two Turgo turbines with permanent magnet alternator. This is a privately owned retreat center near Whistler BC. 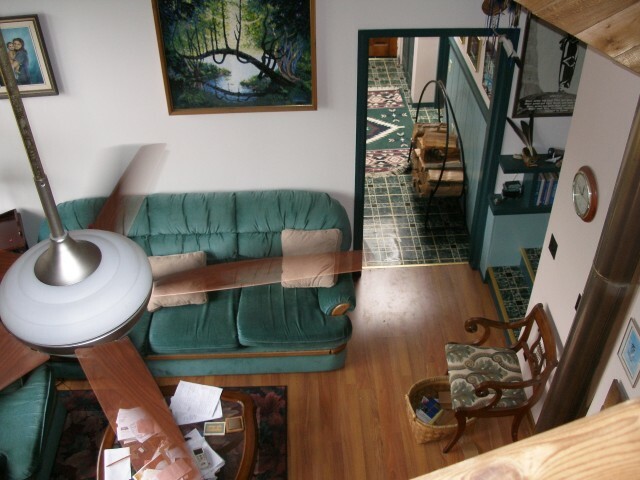 The isolated location makes it an ideal setting for energy independence. 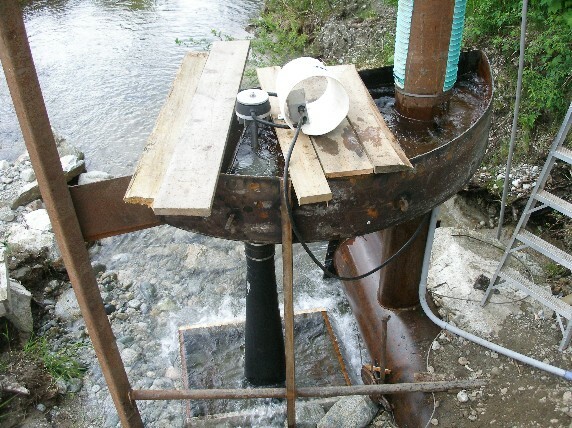 Water flows from the steep mountain immediately above the camp, and is directed through a 4 inch penstock to a manifold supplying the two turbines, each with two nozzles. A Trace 4000 watt sine wave inverter has plenty of capacity to run the facility. An 800 amp hour battery bank supplies the 24 volt input. Hauling in the three inch pipeline following a snow storm, oh joy! This pipe was joined with insert fittings. 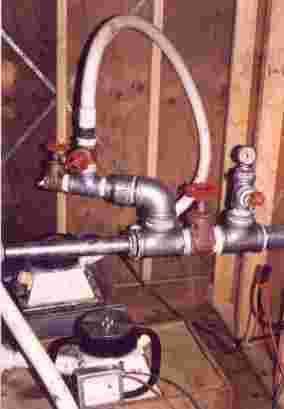 A propane torch is needed to soften the pipe. 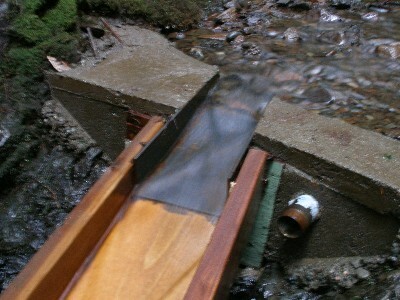 The portable, self cleaning intake was built into a wooden floom. 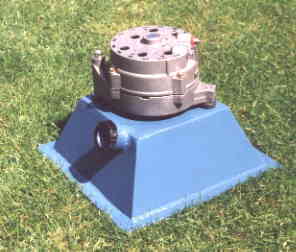 The turbine/generator and valves mounted in a sturdy enclosure. This remote Provincial Marine Park relied entirely on barged in propane for lighting and heat. 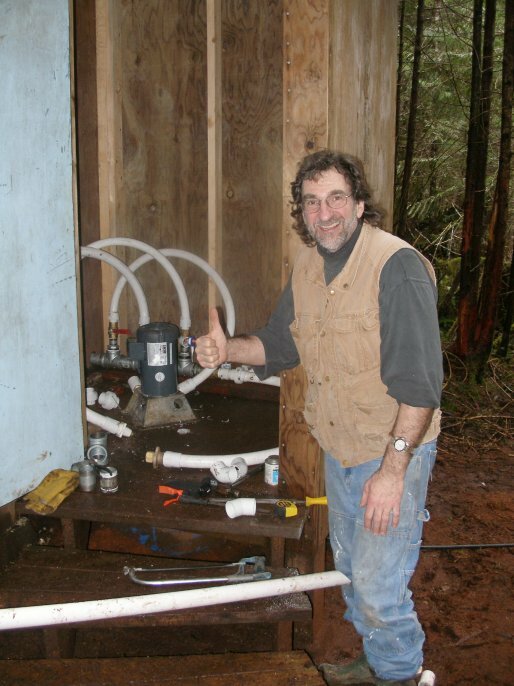 During the early spring we built a small system ideally suited to the needs of the Park Ranger's cabin. Five hundred feet of penstock powers a twin nozzle turbine which charges a set of batteries. 1500 watts of AC, as well as 12 volt DC is available for lighting, radios, and some heat production. 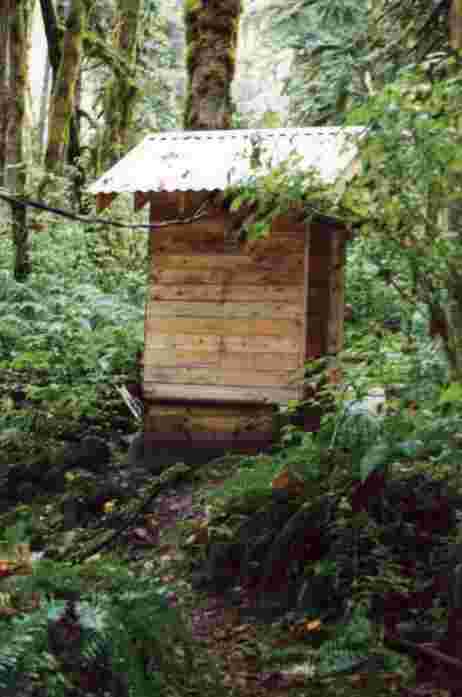 the rangers cabin. The cabin was later rebuilt and during the rebuild, the contractor replaced the diversion load with what he thought was more suitable. 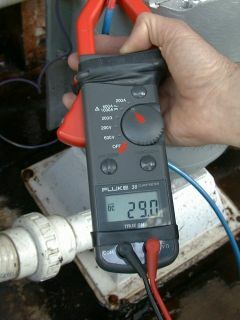 What was not considered was the voltage rating and total resistance of the new load. It was rated for 120 volts, and incapable of absorbing 30 amps at 12 volts. As a result, the inverter kept shutting off on over voltage, and the battery was destroyed and had to be replaced. 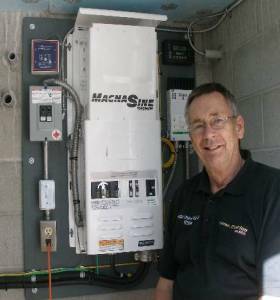 Home power systems are carefully thought out and any changes by the novice should be discussed with the system designer. 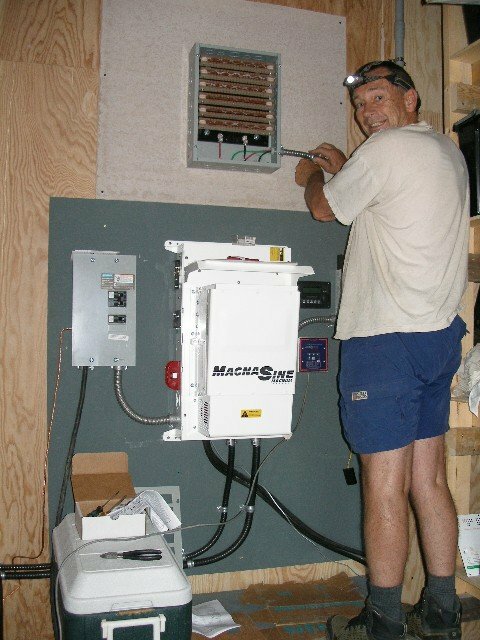 Electrician wiring the diversion load heater. 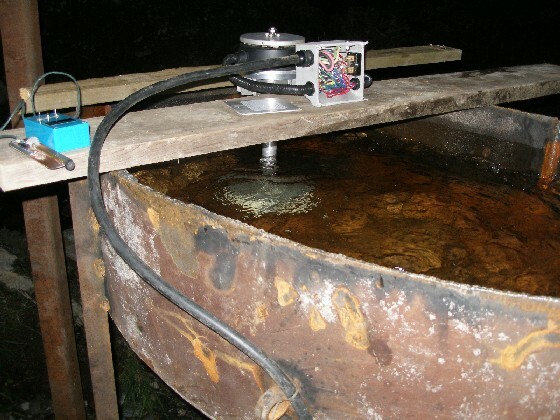 This will burn up the excess power from the hydro generator and keep the battery at the optimum voltage. Turbine / generator: Two nozzle flow flow ES&D Stream Engine . 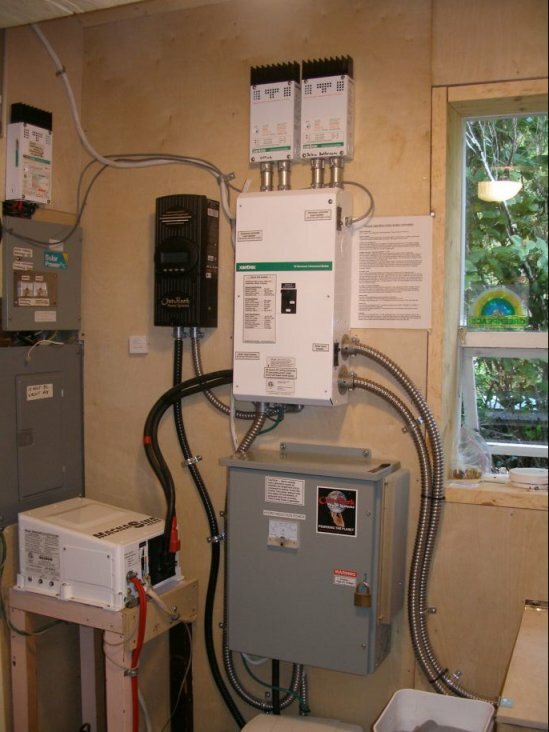 This is a very tidy installation done in 2015, to power a new off grid home. Since the water supply can get very low in summer, provision was made to add up to 1500 watts of solar. 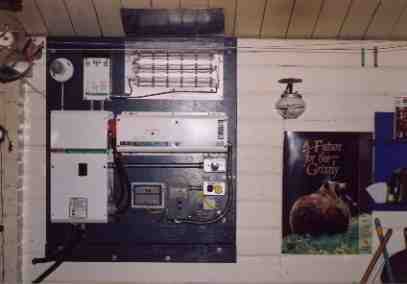 The addition of a solar controller was planned in the layout of the panel board to fit to the right of the inverter shown. 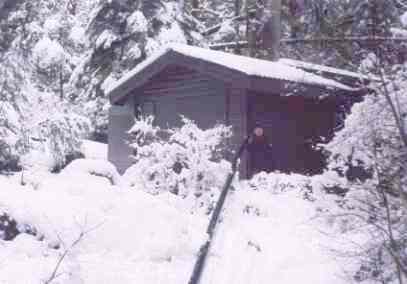 A power line supplies the 120/240 volt output to the house 35 meters away. inside a 3 foot diameter concrete culvert on end. 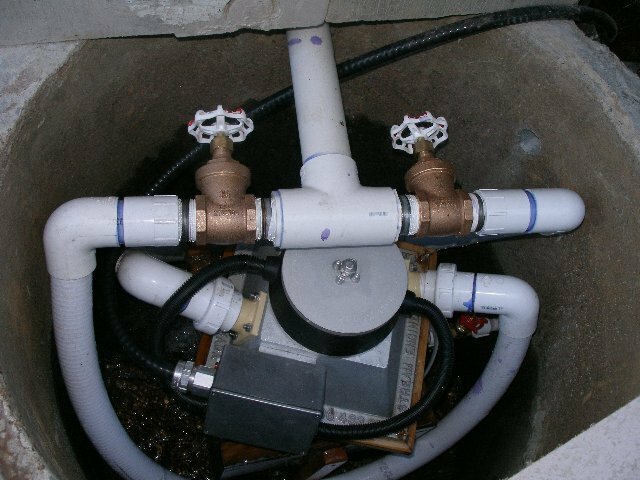 A typical installation might consist of the following components. 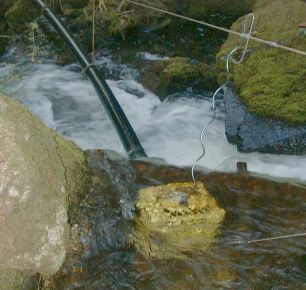 A small intake in the water source to catch and filter the required flow. 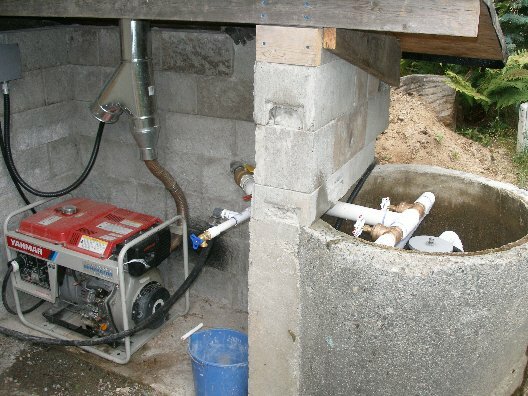 This can be as simple as having the submerged pipe end covered with a bit of wire screen, or fastening a plastic bucket with many small holes cut into it to the pipe end, or building a small dam and settling tank. In any case, there are many ways to make an intake, and this is one aspect of micro hydro that allows for imagination and originality. Since power is the product of vertical drop times the weight of the water, output will depend on the drop, (or head), and flow volume available. Heads of around 100 feet with a flow in the range of 1 gallon per second are easily achieved producing an output in the range of 400 watts. 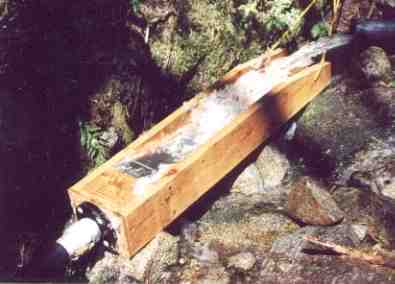 The penstock, or pipe line to carry the water is often made of plastic, either PVC or polyethylene. 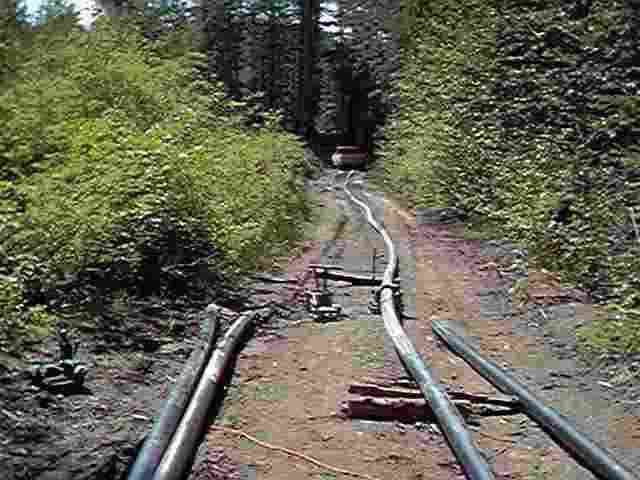 Pipe diameters in the range of 2 to 4 inches are typical depending on the flow requirement and distance the water must be moved. 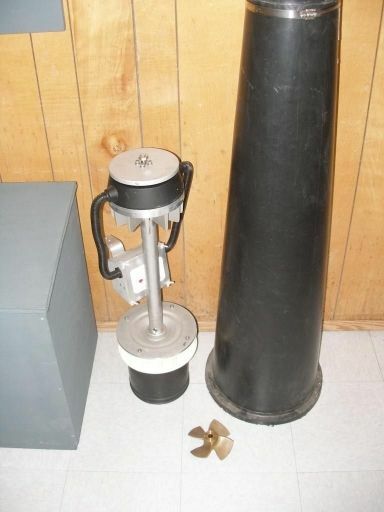 Pictured here is the fusion welder used to join polyethylene pipe lengths. The turbine generator units used in these small systems are based on either standard automotive alternators, newly introduced permanent magnet alternators, or industrial 3 phase motors used as generators. The choice depends on a number of factors such as power line distance, desired equipment reliability, and cost. In a typical situation where periodic inspection and minor maintenance is possible, the alternator system is most common. Power is generated at 12 volts and fed directly to the battery bank. The user is free to make changes to the turbine nozzle size to suit power requirements and or flow conditions. 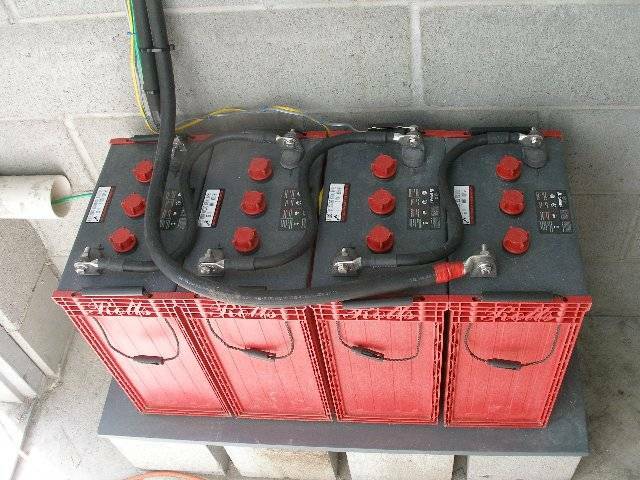 Deep cycle batteries are at the heart of any DC power system and store a tremendous amount of energy for the periodic surges and long term draw imposed by the various electrical loads. The size of the battery bank is determined by the anticipated loads, the available charging power and the budget. 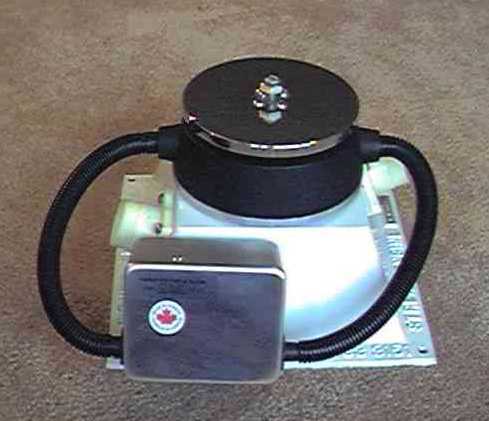 The smallest size might consist of one deep cycle battery with a capacity in the range of 200 amp hours providing sufficient power for a small weekend cabin, while a large installation may be comprised of up to 12 six volt cells wired to produce 12 or 24 volts with a capacity of over 1000 amp hours. Control and monitoring of battery voltage is important to prevent damage from over charging, or from accidental discharge. 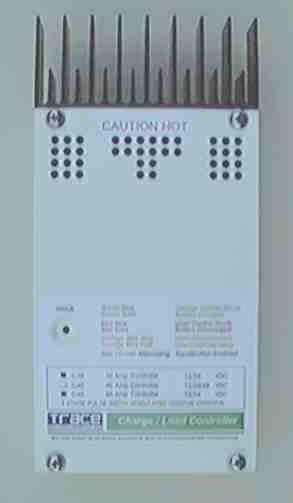 The monitoring equipment consists of indicator meters or lights to inform the user of system status, and the control unit maintains an optimum voltage on the battery by either regulating the generator output or by shunting power to alternate loads such as heating domestic hot water. Powerful DC to AC inverters are used to produce high quality 117 volt AC directly from the battery bank. These units are available in sizes from 125 watts up to 5000 watts and operate at over 90 percent efficiency. They are fully protected against any abnormal operating conditions and take virtually no power when in an idle mode. Pictured is a Schneider (formally Xantrex) XW 4024. Additional photos of typical installations. Top view of the Stream Engine turbine. Two nozzles and electrical junction box visible. 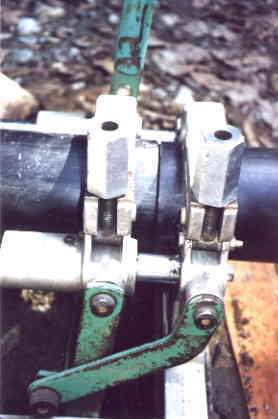 Bottom view of Stream Engine showing bronze turbine runner. 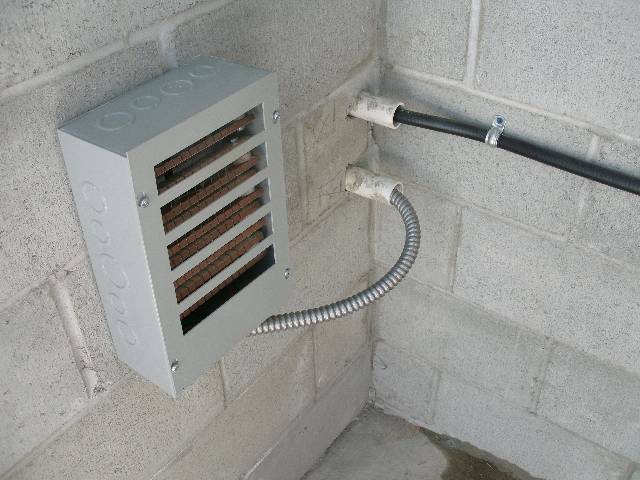 Virtually indestructible, these units can run for years with no maintenance. 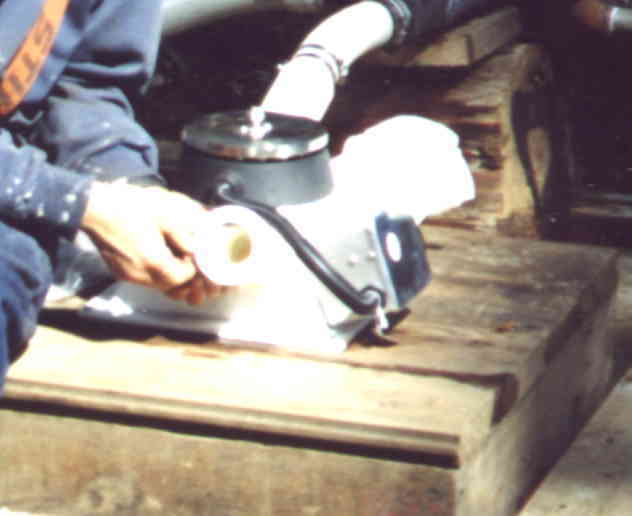 Installing a plastic union on the intake nozzles of a stream engine. 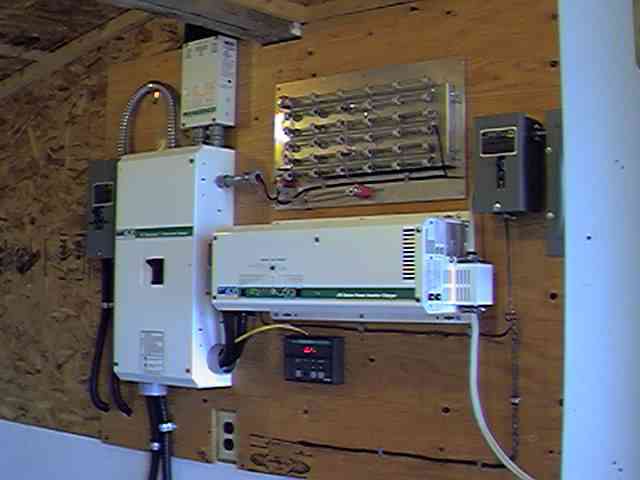 A 3600 watt inverter and switch gear. 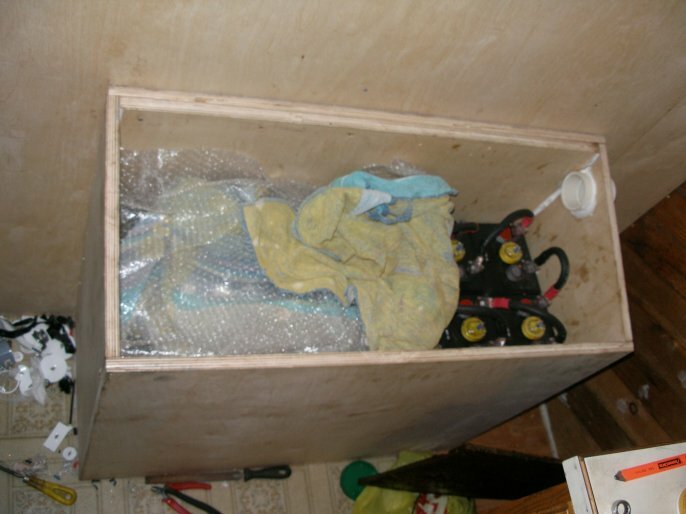 The small sloping panel beside the large box represents the ultimate in self cleaning intakes for small projects. 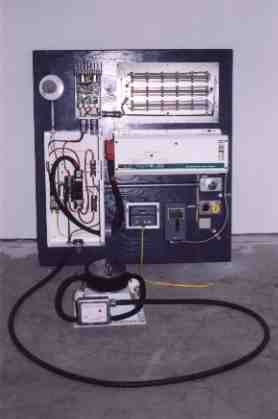 An AC induction generator used with transformer and rectifiers in a DC battery charging application. 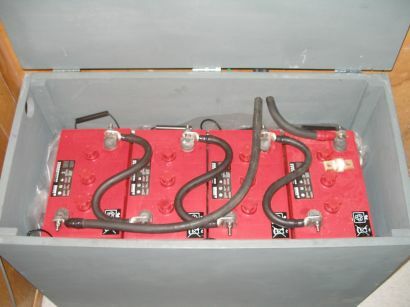 Six 245 Ah batteries wired for 735 Ah at 12 volts powers a Statpower sine wave inverter which runs a satellite phone and internet connection. The installation we did for Parks. Pipes are connected quick connects so the system can be disassembled at the end of the season. 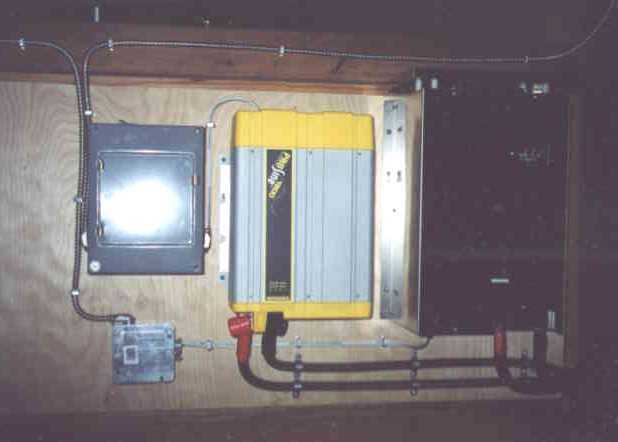 The complete electrical system installed in the rangers cabin. Welding and hauling 4 inch poly pipe. Some times the weather is against you. Here we are hauling in a pipe line following a snow storm! Automotive alternators make an inexpensive power source, but lacks the long life and efficiency of the newer stream engines. Pure sine wave output from an 1800 watt Statpower inverter. 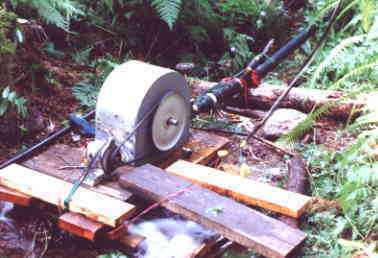 An early pelton wheel powering a Rangers cabin in a BC marine park. 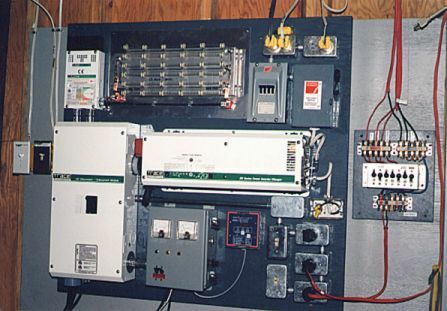 Pre-made electrical panel includes 1500 watt inverter, 175 amp disconnect switch, metering, battery control and AC output breakers. 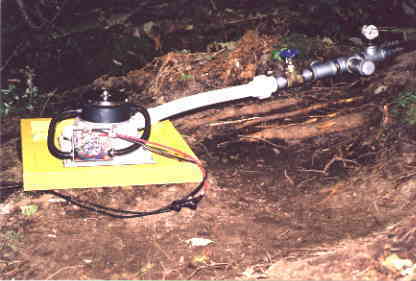 Stream Engines are the best in small DC hydro generators, brushless, permanent magnet and water cooled.